What is a Farmessorian? A student at Clay-Platte Montessori Middle School who explores sustainable agriculture and our human relationship with food at Boone's Farm. Well, first we practiced on watermelons and summer squash....only those that pass a rigorous visual inspection, a blossom-end sniff test and careful knocking and listening get to ride on the Gator from field to table. So it is with pumpkins. And if you're a very lucky pumpkin, you get delivered into the reverent hands of Chef Mike/No-Limit Catering and Lerry, both Le Cordon Bleu trained chefs, for roasting and baking to pumpkin pie! For more info on the 2011 Farmessorians Pumpkin Pie Adventure click here. On February 22, 2011, University of Missouri Extension Horticulturist Marlin Bates shared with the Middle School class some information about plant families, crop rotation, integrated pest management and planning a garden. Each child planned a garden plot to feed a certain number of people for a season with a variety of vegetables of their choice, and worked on a card deck of horticultural information for each vegetable that we'll use in the field at the farm. Thank you, Marlin, for sharing your time & expertise! Do You Like Green Eggs and Ham-burger? Yes, we like Green Eggs and Ham (burger)! We like them, Sam-I-Am! Click on the photo on the left to go to Pepsi's voting website. 3. VOTE for this idea! You can vote once a day during the month of November. 4. Share and forward this with friends and family! Anyone age 13+ with a United States email address can vote. Help us build a greenhouse for year-round growing, an irrigation system and improvements to our chicken coop - It only takes a click to help! January, 2010. Several of our students began writing SARE Youth Grant proposals with the help of Jim Pierce, Lincoln University Extension's Innovative Small Farmers Outreach worker. 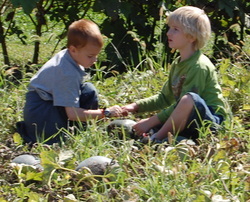 In addition, Boone's Farm submitted a Farmer/Rancher Grant proposal to help fund the further growth of our Farmessorians projects, because we feel that a Montessori format is a great way for both the children and us to continue our exploration of sustainable farming. We share with the children and they teach us in return! While none of the grant applications submitted were funded, Izaak's, Hunter's & Taylor's ideas about researching how animals are fed affects the final taste of the food eventually became the Green Eggs & Ham-burger event at the school. It was important enough research within the school community the kids (okay, and the teachers) decided to just do it anyway! The children helped maintain the system and learned about pH, nutrients, air, water, light and aphids that moved in with the potted plants. In the atrium with our growing produce, the children applied their knowledge of math, language and science to the practical task of developing a plan and making decisions for their business. The table in front of the window was a favorite place for other work, too. 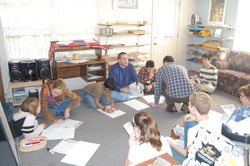 In the very early spring of 2010, Middle School Director BetiWyn Holcombe asked for ideas to help the children raise funds for their trip to Greece & Italy in 2011. We built a small hydroponic raceway system with supplemental T5 lighting for the classroom and began growing herbs and salad greens that were offered to school community families on a donation basis. 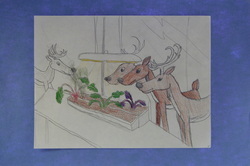 The deer that live in the school's 10-acre wood were both excited and frustrated by the tender green delicacies...on the other side of the window! Fresh eggs by subscription and fresh herbs through the winter..... Vegetables, meat & eggs through the summer! A whole bunch of really awesome companies have helped us by donating cool stuff for our Market and our projects. Thank You all for your generous gifts! Click here to shop online direct from Johnny's website! Place your order online as usual. At checkout, in the "Note" field, please enter, "This is a Clay-Platte Montessori community order - Please refer to Amber for processing." Your order will be billed and shipped directly to you, and you'll be supporting our children's fund-raising efforts! Stay tuned in by adding yourself to our email list. MoonShine Mix, Azomite, seeds and fresh herbs.... and transforming a pasture into a garden! Click on the photo for a glimpse into our work. A link to more photos. EarthCare KC is our contractor for lawn applications of Azomite, Aragonite and other organic fertilizers and lawn care. As a special bonus for us, all of the CPCH families can get started on getting out of the chemical game and making thier lawns healthier for us, our pets and even our grass....and help support our fund-raising. For each average lawn application of Azomite, our Greece/Italy fund grows by $17! Click HERE to contact EarthCare and schedule your lawn today!